Live the life of a Queen while searching for Cleopatra's Gold. Click here to play! Scour her ancient Egyptian palaces to find hidden treasures and a jackpot that could very well change your life. Now is the time to live amongst the Egyptians and steal Cleopatra's Gold. Follow Cleopatra's every move if you want to find her gold. She will substitute for all other symbols, except the scatters, and will double prizes when she appears in a winning combination. This infamous beauty will definitely help you in collecting as much treasure as you can. Her palace also harbors plenty of other relics that will pay off big. If you can spin two to five jeweled beetles, you will receive up to 1000 times your bet. Five egyptian eyes will pay out 1000 times your bet. If you find the Pyramid, you'll truly uncover Cleopatra's Gold. Spin two or more of these symbols anywhere on the board and you'll multiply your total bet respectively. They will also uncover secret bonus features that will reward you with free spins. Join in the search for Cleopatra's Gold and you might just leave with a chest full of treasure that will change your life. 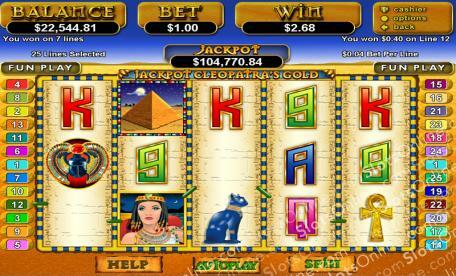 Two or more Egyptian Pyramids anywhere on the board will mutliply your total bet respectively. Three or more Pyramids will trigger a free game feature in which you will be given 15 free games. All prizes are tripled during the games. 15 more games will be awarded if three or more pyramids appear during your free games. Cleopatra with her dark braided hair and golden jewels will substitute for all other symbols, excluding the scatters. Five or more of her will hit the Progressive jackpot. She also doubles prizes if she appears in any winning combination.